There are various tools and aids to help you maintain your oral hygiene in-between dental visits. 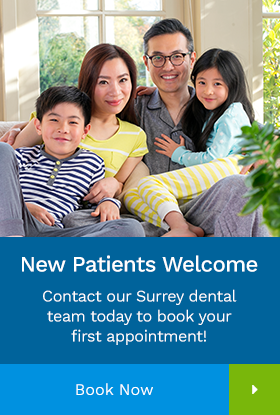 Here is some information that our Surrey dentists want to share with you. Professional cleanings twice a year combined with daily self-cleaning can remove a high percentage of disease-causing bacteria and plaque. Dental floss is the most common interdental and subgingival cleaner and comes in a variety of types and flavors. The floss itself is made from either thin nylon filaments or polyethylene ribbons, and can help remove food particles and plaque from between the teeth. Vigorous flossing with a floss holder can cause soft tissue damage and bleeding, so great care should be taken. Floss should normally be used twice daily after brushing. There are two basic types of mouth rinse available: Cosmetic rinses which are sold over the counter and temporarily suppress bad breath, and therapeutic rinses which may or may not require a prescription. Most dentists are skeptical about the benefits of cosmetic rinses because several studies have shown that their effectiveness against plaque is minimal. Therapeutic rinses however, are regulated by the FDA and contain active ingredients that can help reduce bad breath, plaque, and cavities.